Photoresist And Photoresist Ancillaries Market size was valued at more than USD 3.5 billion in 2016 and is expected to grow with a CAGR of over 6.5%. Growth observed in semiconductor industry and developments in display technology will drive the photoresist and photoresist ancillaries market during the forecast years. They are used in high density packaging and wiring configuration in multi-layered semiconductor manufacturing, which are indispensable parts of laptops, computers, servers, and phones. They are also used in consumer electronic products such as music players, household appliances, etc. and employed in other industrial activities. Global semiconductors industry size stood at more than USD 300 billion in 2016. Due to improving economic condition in developing countries and increase in disposable income of people, demand for electronic gadgets and appliances are on the rise. This will increase the semiconductors demand, which in turn will propel the growth of the industry in the coming years. The photoresist and photoresist ancillaries market products are mainly solvent-based solutions which include electronic-grade solvents, polymer resins, stabilizers, surfactants, photosensitive chemicals, and cross-linking agents. These solvents release volatile organic compounds which are carcinogenic in nature, reacts with sunlight to form air pollutants and are hazardous to human health and environment. Various environment and health regulatory agencies like Environmental Protection Agency (EPA) and Registration, Evaluation, Authorization and Restriction of Chemicals (REACH) have imposed strict rules and regulations regarding storage, transport and use of these solvents. This may hamper the global photoresist and photoresist ancillaries market in the future years. By product grade, photoresist market is segmented as g- and i-line, ArF dry, KrF and ArF immersion. ArF immersion grades is used to manufacture micro and nano-scale electronics component and has a significant share of the market. With current trend of developing smaller electronic devices with extended functions, share of ArF immersion grades is poised to increase during the forecast timeframe. KrF also have a substantial share of the global photoresist market as it is employed in manufacture of microelectronics and its share of the market was valued at more than USD 400 million in 2016. ArF dry grade is used in high resolution photo-patterning and photolithography processes and its share is expected to grow at a moderate rate. G- and i-line grades can operate in mid-UV wavelengths and can provide resolution from 0.3 µm to more than 1 µm. This grade will likely grow at a steady rate in the coming years. Photoresist ancillaries market is categorized by product into four grades which includes antireflective coatings, edge bead removers, photoresist developers, and other products such as specialty solvents, etchers and. primers or adhesion promoters. Antireflective coatings have a significant share and it is expected to increase owing to properties like contrast improvement and multiple reflection suppressions which directly effects the process cost. Photoresist developers segment will grow at a steady till 2024 as demand for metal-ion free developers, which are environment and user friendly, is poised to increase in the next few years. Edge bead removers segment has a considerable share of the industry and it is expected to grow at a healthy rate during the forecast period as they are extensively used in photolithography to remove edge bead build-ups in spring coating process. 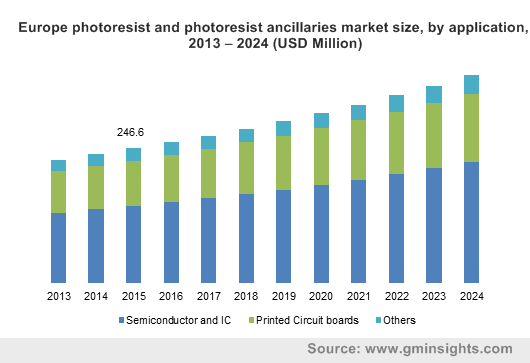 Photoresist and photoresist ancillaries market based on application is segmented as semiconductors and integrated circuits (ICs), printed circuit boards (PCBs), and other applications which includes nanoelectromechanical systems (NEMS), microelectromechanical systems (MEMS) and sensors. Semiconductors and IC application segment has a significant share which is expected to further rise during the forecast timeframe due to high demand for semiconductors from electronics industry. PCBs also have a substantial share of global photoresist and photoresist ancillaries market as they are widely used in electrical devices in automobile, medical, lighting, defense, etc. This segment will grow at a slower rate till 2024 when compared to the other categories. Asia pacific has a substantial share of the global photoresist and photoresist ancillaries market due to booming electronics sector in this region. Outsourcing of electronics manufacturing activities from Europe and the US to Asian countries like China and South Korea have transformed the region into an electronics hub. The regions share is poised to increase further in the coming years owing to increasing purchasing power of people in this region. North American market was valued at more than USD 350 million in 2016 and its share will grow at a steady rate due to revival of the semiconductors industry as well as increasing demand for antireflective coatings. Demand for antireflective coatings will also drive the European market which is expected to grow till 2024. The global photoresist and photoresist ancillaries market is increasingly consolidated with top four companies accounting for more than three quarters of the total market. These companies are Tokyo Ohka Kogyo Co., Ltd., JSR Corporation, The Dow Chemical Company, and AZ Electronic Materials SA. Other participants include FUJIFILM Electronic Materials Co., Avantor Performance Materials Inc., DuPont, Sumitomo Chemical Co., Ltd., Shin-Etsu Chemical Co., and LG Chem Ltd.
Top companies are trying to increase their market share through R&D activities, strategic alliances, capacity expansion and new manufacturing facilities in potential growth areas. For instance, The Dow chemicals company set up a global R&D center in South Korea for faster response to changing dynamics in the industry. Tokyo Ohka Kogyo Company completed the expansion of its production facility in Japan and JSR Corporation announced a strategic partnership with PERI Corporation to strengthen its market position in South Korea. Companies such as LG Chem Ltd. and the Dow Chemical Company relies on significant level of backward integration to maintain their competitive advantage. Semiconductors and ICs is the application segment that is chiefly driving the global photoresist and photoresist ancillaries market. The demand for semiconductors are expected to increase further till 2024 as they are extensively used in many electronic and communication devices. Growing trend of decreasing the size of electronic gadgets will affect the industry positively by propelling the demand for PCBs, NEMS, and MEMS. Tech-savvy population growth in developing countries such as China, India, South Korea, etc. and increasing income levels will create high demand for electronic goods which will augment the industry.